An Italian palazzo in 2017, a deep-brown toned 150th anniversary booth in 2018 and a very cool hangar-inspired setting this year – IWC Schaffhausen regularly shows us a new facet of the brand. New, aviation-inspired timepieces took off at the SIHH. It is quite dramatic to see an almost 80 year-old aeroplane standing in an exhibition booth for watches. The glittering chrome covered body of the Spitfire with the open lid of the V-12 Rolls-Royce “Merlin” engine commands respect. The shape of the hangar echoes the same time period of the 40s with mission briefing tables hosting watch presentations this time. The staff is wearing army green jumpsuits. Behind the plane there is a dais where a band dressed in mid-1900 style is playing contemporary music in tones of the 40s, rather well. The Spitfire – also called Supermarine Spitfire – is the most widely produced and strategically important British single-seat fighter of the WWII. It was designed by Reginald J. Mitchell, British aircraft designer. Its design with the elliptical wings was inspired by seagulls and was very functional -it provided aerodynamic sleekness and manoeuvrability. The capabilities of the Spitfire made it appear on screen in black and white already in 1942. Produced and directed by the British Leslie Howard, The First of the Few (US title Spitfire) is a documentary about the birth of the Spitfire. Howard portrayed Reginald Joseph Mitchell, the constructor of the aircraft himself. 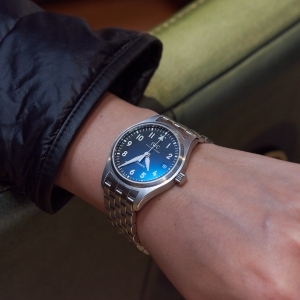 IWC’s SIHH appearance was all about the pilot watches. Although commercial aviation is perfectly common today (with 29 July 2018 being the busiest day in aviation history with 202,157 flights on a single day and 19,000 aircrafts in the skies simultaneously), people share the excitement for pilots, aircrafts, aviation challenges and special flights. I too got goose-bumps flying with the old Junkers Ju-52 last autumn when visiting the new IWC Manufakturzentrum. So no wonder that the one of the most important collections of the company is the Pilot, which now took all the spotlight. 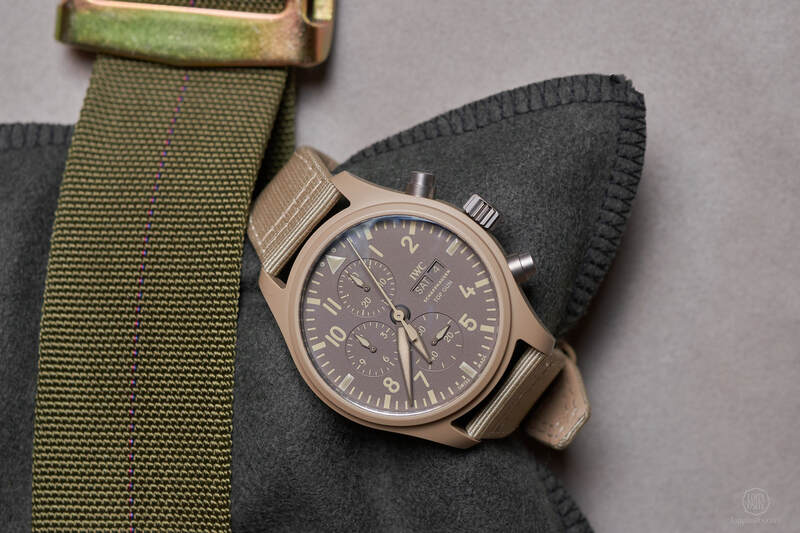 The first “Spezialuhr für Flieger” (special watch for pilots) in 1936 established the tradition of producing Pilot’s Watches in Schaffhausen under the direction of Ernst Jakob Homberger. It had the Caliber 83 with antimagnetic escapement inside and offered a great legibility with high-contrast hands and numerals on the dial. In 1940 the Big Pilot’s Watch Ref. 431 (52-calibre T.S.C.) emerged with a decent 55mm diameter and a proportionally big crown that was easy to rotate even while wearing flying gloves. 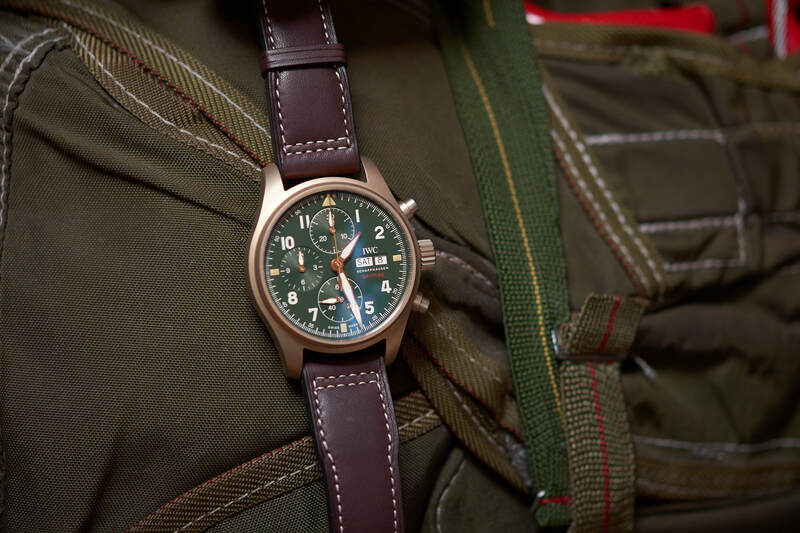 It was made for the German Air Force in a 1,000 piece batch adhering to the needs of clear legibility guaranteed by the previous observation watches. 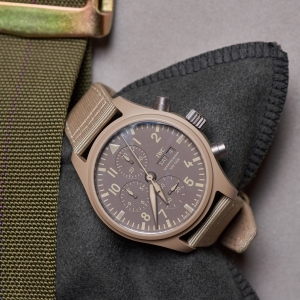 After the WWII, IWC developed a legendary pilot watch for the Royal Air Force, called the Mark 11, with Caliber 89. In order to protect the movement from magnetic fields they used a soft iron cage. The model, being the last true pilot lifesaver, was in service until 1981. The Mark 11 not only set standards in technical feats but also in terms of its design. 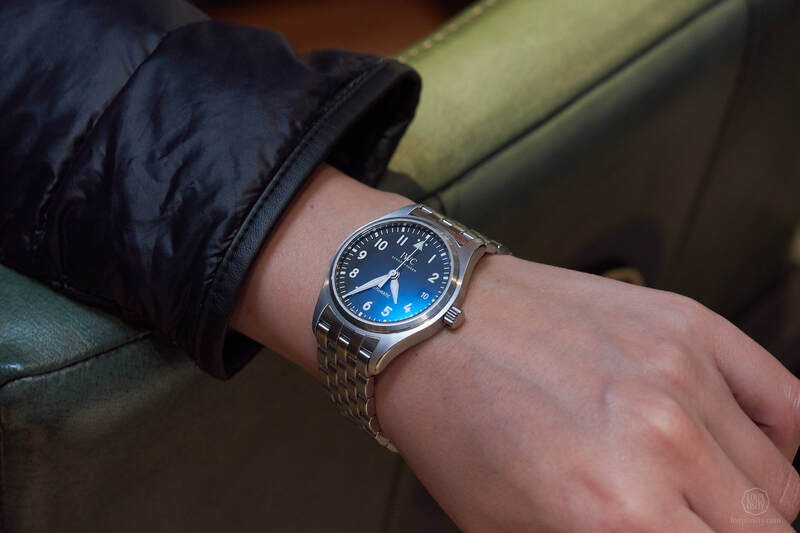 With the rapid development of aeronautical gauges and satellite-aided navigation systems, the usage of pilot watches became more about fashion and belief than real necessity. The spirit of the Spitfire and the design of the Mark 11 inspired the new Spitfire line in the Pilot’s Watches collection. 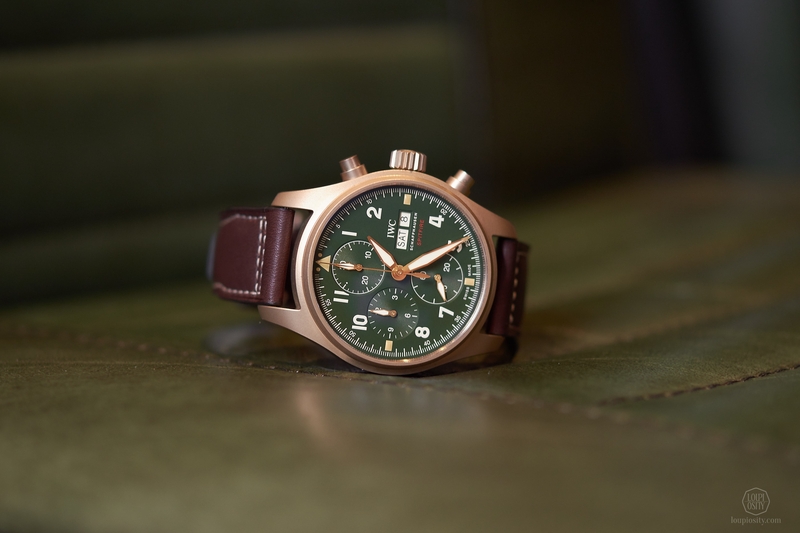 All models feature IWC-manufactured calibres and celebrate the unique engineering of the legendary British fighter aircraft. The bronze 41mm Pilot’s Watch Chronograph Spitfire has a movement from the 69000 calibre family – known from the Ingenieur chronographs. 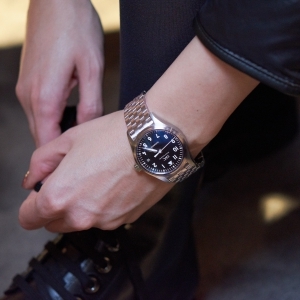 The 69380 landed in pilot’s watches for the first time. 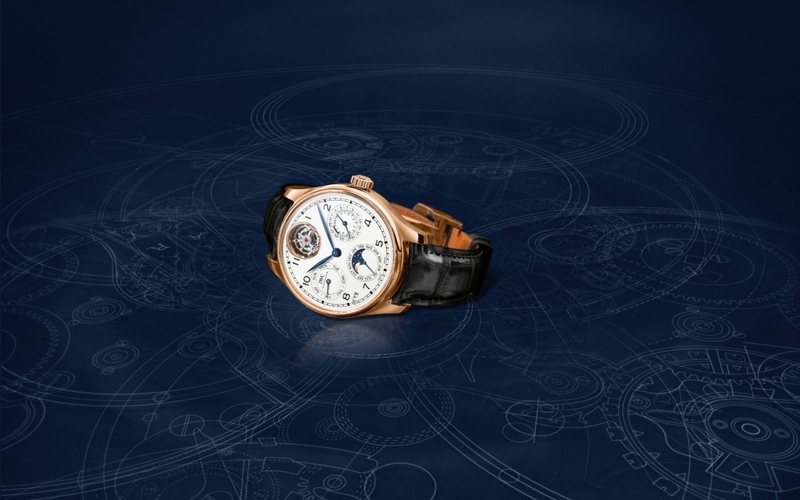 The chronograph hours and minutes are shown on two sub-dials at 9 o’clock and 12 o’clock. The set includes a special edition called the Pilot’s Watch Timezoner Spitfire Edition ‘The Longest Flight’ (Ref. IW395501), which is dedicated to a remarkable project. 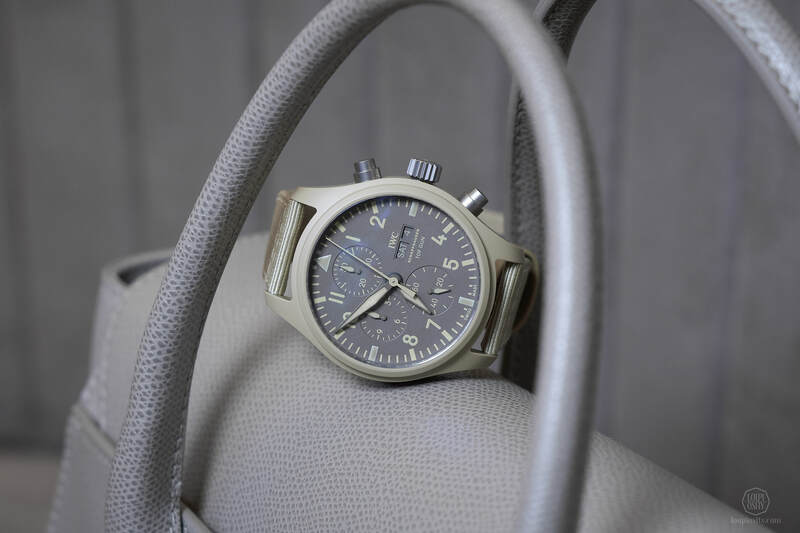 At SIHH 2019, IWC Schaffhausen announced to support two British pilots to accomplish a flying challenge: ‘Silver Spitfire – The Longest Flight’. Steve Boultbee Brooks (appearing in the video above) and Matt Jones are hoping to open a new chapter in aviation history with the first around the world flight in a Spitfire plane. They are the co-founders of the Boultbee Flight Academy, which is the world’s first Spitfire training school and approved Spitfire flight provider. In the summer of 2019, the two gentlemen will cover more than 43,000 kilometres and 26 countries with the iconic aircraft, the LF MK IX built in 1943 and carefully restored – the very one exhibited in the booth. Its maximum flight attitude is 43,000 feet and the maximum speed is 650km/h. The flight route will strongly depend on the weather conditions. As they fly through most of the continents the 75+ year-old plane has to handle extreme circumstances. Since the Spitfire does not have any reserve tanks, refuelling is necessary every 750 kilometres. Thus, the route will be divided into around 100 segments. IWC introduced novelties in the TOP GUN collection too, which takes its name from the United States Navy Strike Fighter Tactics Instructor program. Since Tom Cruise we all know that only the top one percent of naval aviation pilots can attend this course. 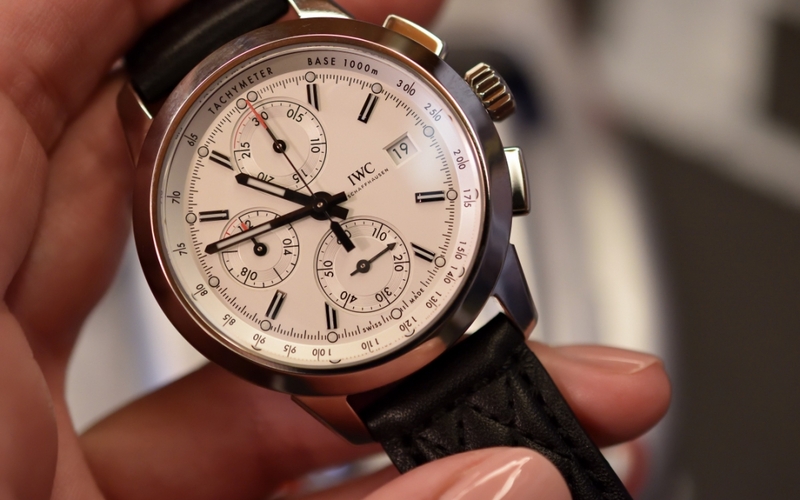 The TOP GUN was in IWC’s repertoire since 2007. At the SIHH 2019 four new models were presented, all in ceramic, except the Pilot’s Watch Double Chronograph TOP GUN Ceratanium where all case components are made from Ceratanium®. ‘In the new TOP GUN line, we are using Ceratanium® for a pilot’s watch for the first time. 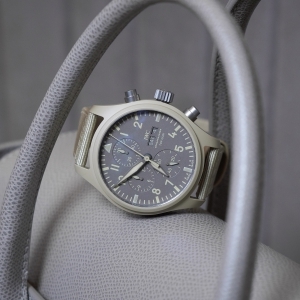 This material developed by IWC combines the excellent material properties of titanium and ceramic.’ – explains Christoph Grainger-Herr, CEO of IWC Schaffhausen. Ceratanium® (ceramized titanium) is a material developed by IWC and it is a lightweight but very scratch-resistant new material. I love the matte technical look of these models and fell for one in particular. 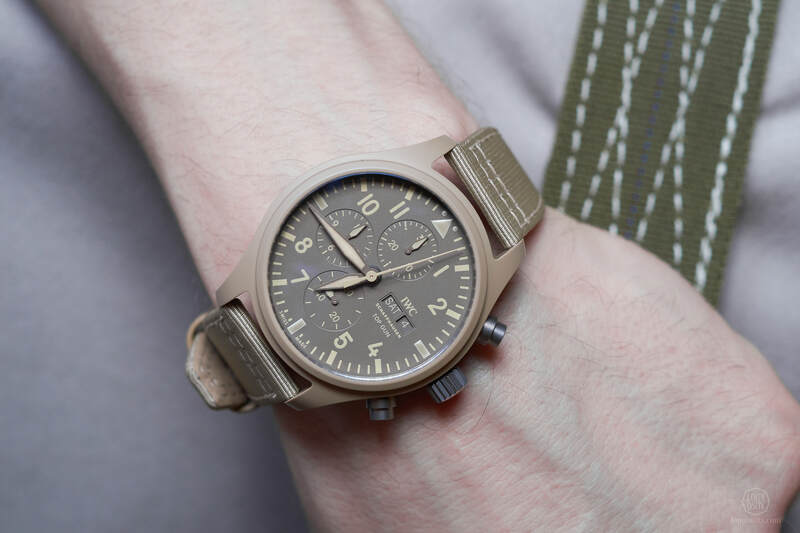 The Pilot’s Watch Chronograph TOP GUN Edition ‘Mojave Desert’ has a sand-coloured ceramic case which got me completely – I guess my time in Oman with its beautiful sand dunes moved these colours into my sweet spot permanently. The colour was achieved by a combination of zirconium oxide with other metallic oxides. This version comes in a limited edition of 500 pieces. Mojave Desert occupies a significant portion of Southern California and parts of Utah, Nevada, and Arizona (65,000 square kms). It is the home of lizards and coyotes and the Naval Air Weapons Station China Lake (NAWS), which is a huge weapons testing and training range operated by the U.S. Navy. 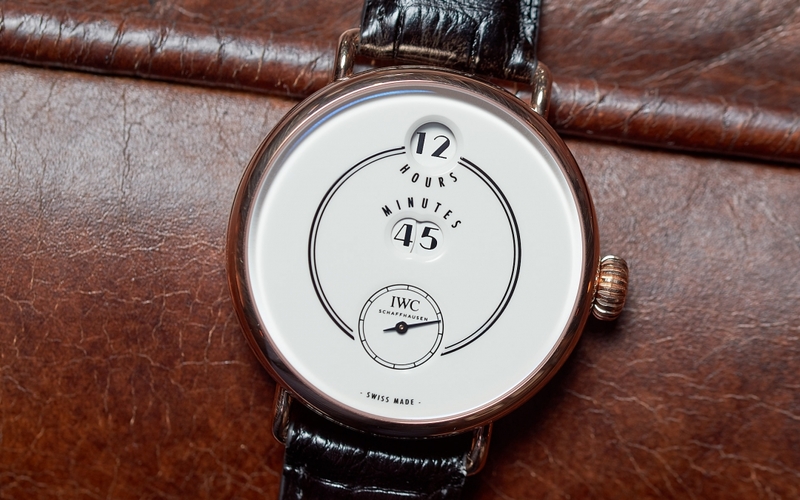 IWC 150 anniversary models at SIHH 2018 PRESS RELEASE: IWC Schaffhausen celebrates 150 years in 2018 - the company presented a special Jubilee collection at SIHH 2018 that consists of 27 limited-edition models. IWC Ingenieur Limited Editions in Vienna The Viennese IWC boutique hosted a gathering to welcome three IWC Ingenieur Limited Editions, dedicated to sporty yet elegant car enthusiasts. We participated of course.